A couple of the Bills hometown players are working out together. Buffalo native Naaman Roosevelt and Orchard Park native Jon Corto are putting some time in together at the gym according to Roosevelt’s twitter account. Roosevelt even went so far as to have his photo taken next to Corto’s mounted jersey at the gym. Presumably Roosevelt is at Corto’s local gym where he works out. Obviously the jersey is from when Corto was still a linebacker. He’s 33 now that he plays safety. The Buffalo Bills have announced that they have signed safety Jon Corto to a contract extension. Details on the home page at Buffalobills.com. With Shawne Merriman being placed on injured reserve Saturday, his roster spot was filled by WR Naaman Roosevelt, yet another local WNY product on the Bills 53-man roster. The Bills now have three local players on their active roster in S Jon Corto (Orchard Park), FB Jehuu Caulcrick (Clymer) and WR Naaman Roosevelt (Buffalo). Roosevelt was spending extra time after practice Friday fielding punts, so there would seem to be a possibility that he could be active Sunday against the Steelers for return duty. Caulcrick saw his first NFL regular season action last week against the Bengals and Corto is now in his third season with the Bills. Nice to see some local talent dotting the roster. We’ll see if they’re all active for Sunday’s game. Just two players not participating in practice Wednesday. Terrence McGee and Cornell Green are not participating in practice. S Jon Corto is practicing with his teammates, but remains on Reserve/PUP. The team has until Nov. 8th to decide on when or whether to elevate Corto to the active roster. There’s a very good chance that Corto could be activated sooner rather than later. Corto would be an immediate boost to Buffalo’s coverage units on special teams. 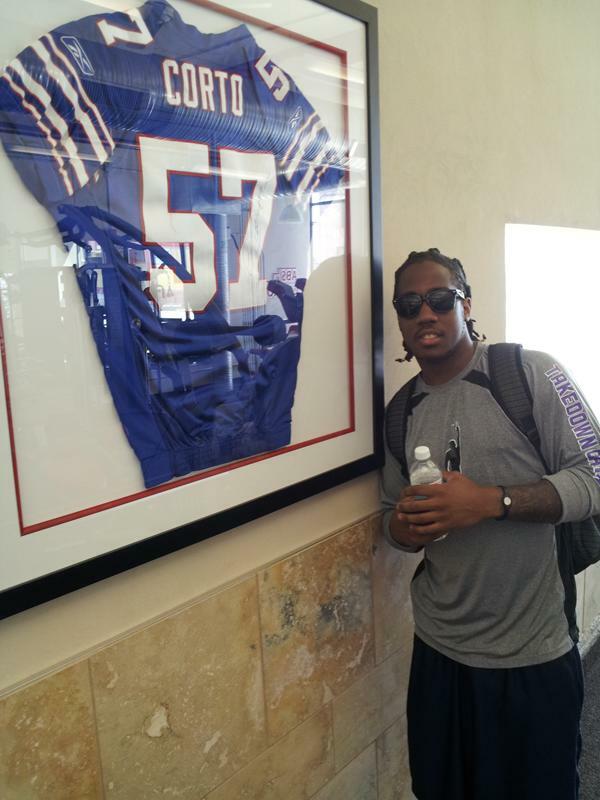 Bills safety Jon Corto will not be on the field when practices begin Thursday. Corto told reporters upon his arrival at training camp that a pre-existing wrist condition required surgery after spring practices. Corto is expected to be placed on Active PUP Thursday. Though LB Josh Stamer is back on the Bills roster after signing with the club Wednesday, he won’t be getting his old jersey number back. Stamer wore #57 in his first stint with the Bills, but that number is currently occupied by Jon Corto. So Stamer will be wearing jersey number 50 for the final two games this season. Here’s where you can find Bills players on the radio dial Thursday. Jon Corto – Shredd and Ragan, 103.3 The Edge @ 4:30 PM. You can listen online if you’re outside of the listening area. There’s no question this loss still stings, but we delve into some of the more impressive individual efforts from Monday night right now. BEST PASS BREAKUP COMBO: Marcus Stroud/Bryan Scott – On a 3rd-and-8 at the Bills 23-yard line, Stroud tipped a Brady Quinn pass at the line and Scott knocked it away from Kellen Winslow to force Cleveland to settle for a field goal off a turnover. BEST DEFENSIVE SERIES: Jabari Greer, Terrence McGee, Bryan Scott – The three defensive backs were instrumental in forcing Cleveland to walk away with just a field goal after Trent Edwards third INT of the first quarter. Faced with defending a 12-yard field, Greer made a great play in pursuit running Donte Stallworth down from behind on an end around for a loss of four. On the next play McGee had tight coverage on Braylon Edwards and was a factor in forcing a second down pass incomplete and on 3rd-and-14 Scott broke up a pass intended for Kellen Winslow. So after making an interception at the Bills 12-yard line, the Browns lost four yards on the drive, went three-and-out and had to take just a field goal. BEST PUNT/DOWN COMBO: Brian Moorman/Jon Corto – Moorman’s high hanging 40-yarder allowed coverage to run under it as Corto impressively caught the ball on the fly to down it at the Browns’ four-yard line. BEST PASS DEFENDER: Terrence McGee – The left cornerback had a career-high six pass breakups as he had almost as many plays on the ball as his top assignment Braylon Edwards, who despite having eight catches have a long of just 23 yards in the game. BEST ONE-TWO PUNCH: Marshawn Lynch/Fred Jackson – The two backs combined for all the yardage gained on the Lynch touchdown drive and on the 45-yard field goal drive in the second half. BEST HOLE PUNCHER: Offensive line – Buffalo’s men up front finally took it to an opponent as they opened consistent holes for the Bills tailbacks and dropped some Cleveland defensive linemen on their wallets. BEST DISRUPTER: Kawika Mitchell – The linebacker was constantly in Brady Quinn’s face contributing a sack and a team high three quarterback hits. His sack effectively stalled a Cleveland drive in which again the Browns had to take just three points on a Dawson field goal. Honorable mention to Marcus Stroud. BEST LIFELINE PROVIDER: Leodis McKelvin – His 98-yard kick return for a touchdown gave the Bills new life late in the contest and got the crowd back into what was suddenly a field goal game. BEST COVERAGE: Bills defense – Facing a 2nd-and-goal from the Bills five-yard line, the Buffalo defense, minus Donte Whitner and Jabari Greer, had solid coverage with Keith Ellison forcing an incomplete attempt out of bounds to Jamal Lewis in the end zone. That was followed by solid coverage on 3rd-and-goal from the five as Quinn had to throw it away out of the back of the end zone for yet another Dawson field goal. BEST BACK TO BACK PLAYS: Terrence McGee – The corner broke up two straight pass attempts to Braylon Edwards on 2nd-and-7 and 3rd-and-7 to force a punt with the Bills down six late in the fourth. BEST FIELD POSITION PROVIDER: Roscoe Parrish – Down six points with five minutes remaining Parrish provided the offense with fantastic field position thanks to a 34-yard return to the Cleveland 48-yard line. BEST BIG TIME RUN: Marshawn Lynch – His 28-yard rumble on 2nd-and-4 from the Browns 29 set up the go ahead touchdown on the Edwards sneak. BEST TRAPPERS: Bills cover teams – Buffalo’s special teams coverage units held the dangerous Josh Cribbs six yards under his kick return average which was third best in the league. Moorman also forced Cribbs to make a pair of fair catches with his other punt downed making Cribbs a non-factor in the punt return game. BEST AWARENESS: Roscoe Parrish – The Bills slot receiver converted a 3rd-and-7 on Buffalo’s opening drive breaking a pair of tackles and stretching for the first down stick. BEST OPEN FIELD TACKLE: Reggie Corner – Covering Wes Welker, Corner closed the space on a receiver screen and dropped the slot receiver for no gain. BEST ANTICIPATION: Bryan Scott – The safety quickly recognized the end around play to Randy Moss and dropped the wideout for a two-yard loss. BEST PASS BREAKUP – Terrence McGee – His shot on intended receiver Ben Watson as the tight end tried to make the catch jarred the ball loose for an incompletion on a 3rd-and-9 forcing the Patriots to settle for a field goal. BEST LEG: Rian Lindell – The Bills kicker had a pair of touchbacks to help keep New England’s number one ranked kick return unit from making a big play. BEST TOUCH: Brian Moorman – The Bills punter may have had his most consistent day of the season with four punts pinning the Patriots inside their 20-yard line. His best kick was probably his 36-yard placement punt that his coverage unit downed at the New England three-yard line. BEST COVERAGE TACKLE: Jon Corto – The linebacker knifed in low at Ellis Hobbs and dropped him for just a 13-yard return. Copeland Bryan had an assist on the play. BEST RED ZONE STOP: Ryan Denney/Ko Simpson – The two defenders stopped BenJarvus Green-Ellis on a 3rd-and-2 at the Bills 19-yard line for no gain against forcing the Patriots to take a field goal in the third quarter. BEST THIRD DOWN STOP: Marcus Stroud – On a 3rd-and-1 Stroud beat his man to take down Kevin Faulk for a three-yard loss to force a punt. BEST KEEP HOPE ALIVE PLAY: George Wilson/Marcus Stroud – The safety and defensive tackle combined for a sack on Matt Cassel in the fourth quarter. Stroud forced the fumble and Wilson recovered the ball at the Bills 44-yard line down 13-3 to give the offense an extra possession. BEST RETURN: Leodis McKelvin – His 85-yard return gave the offense an additional chance to put points on the board late in an effort to make a run at the Patriots in the waning moments. BEST NOSE FOR THE BALL: Ryan Denney, Ko Simpson, Kawika Mitchell – All three finished with 11 tackles on the day to lead the team and were active from start to finish on a day when Buffalo’s defense logged a lot of time on the field. BEST EXECUTION: James Hardy/Trent Edwards – It came a little too late, but Edwards best throw went right where it should go to Hardy’s backside shoulder on the touchdown reception late.